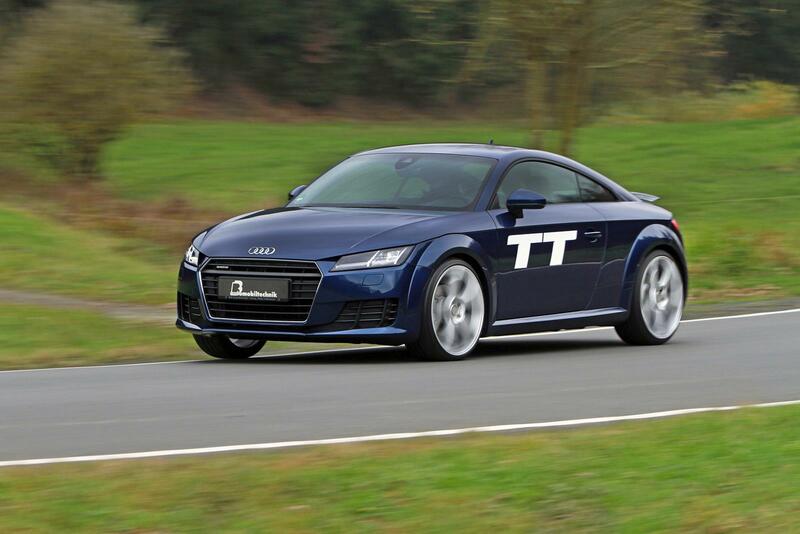 German adjuster B&B has revealed an upgraded set for the Audi TT of the third generation. B&B is one of the initial adjusters to take a stab at the innovated Audi TT. The adjuster has stopped on the base 2.0-litre TFSI powertrain producing 230 hp (or 221 kW) and torque of 370 Nm (or 272 lb-ft) in the regular vehicle. The stage 1 set (€1,198) will increase the power to 300 hp (or 221 kW0 and torque of 272 Nm (310 lb-ft) thankfully to electronic injections system changes and a minor enhancing of recharger pressure. Stage 1S has changed the intake pipes and air paths so that the output increased up to 310 hp (or 228 kW) and torque of 435 Nm (or 321 lb-ft). The customers who own Audi TT have a possibility to obtain the stage 2 set for €3,950. This program enhances power to 326 hp (240 kW) and torque of 450 Nm (or 332 lb-ft). This enhancing was achieved by adding an innovated exhaust system with sportive catalyzer and a charger pressure increase by 0.25 bar. This set will also reduce temperature of the powertrain and exhaust turbocharger at the same time enhancing performances. The last, but not the least is stage 3 set from B&B for €9,950. This one increases power to 360 hp (or 265 kW) and torque of 500 Nm (or 369 lb-ft) because of other turbocharger along with innovated charger air cooler, sportive exhaust system and other changes. An oil cooling system is available for an extra €1,295. At the same time, sportive spring packages cost starting from €298. They bring the vehicle closer to the road by 30 mm front and 25 mm back. There are other upgrades and 20-inch wheels with 265/30 R20 tyres, four-or six-piston calipers, stabilizers (starting from €498) and an outstanding exhaust enhancing power by 14 hp (or 10 kW) more. An available racing exhaust system adds 20 hp (or 15 kW).